Kotaku 'Shop Contest: Assassin's Creed Elsewhere: The Winners! What time period could be more exciting than the French Revolution for Assassin's Creed? Judging by the number of entries we received for last week's 'shop contest, just about all of them. First, the winning time and place — New York City, 1932. 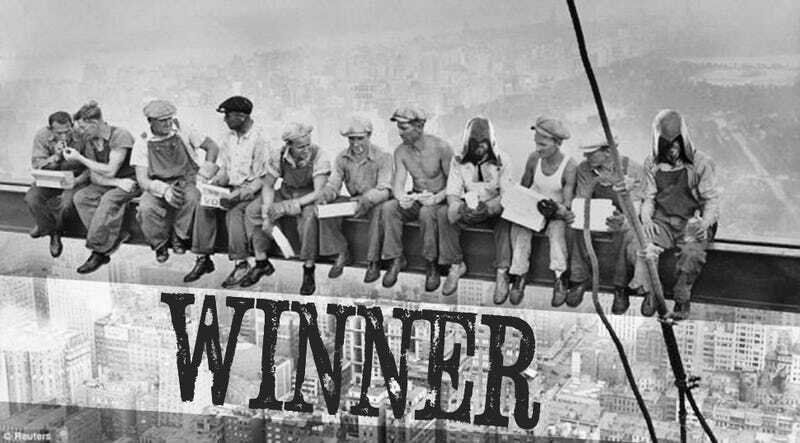 That's when the famous "Lunch atop a Skyscraper" photo was taken, depicting construction crews eating lunch seated on a crossbeam nearly 900 feet above the streets of the city. SkiBum232 adds a couple of assassin's to the classic photo, which is fine as long as there's a bale of hay at the bottom. And since the photo is thought to have been staged to promote the new RCA building, there's a big money conspiracy of some sort going on. Sounds like the perfect place for some strategic murder. Where else can our hooded assassins go? Find out below. RattleheadXYZ — because now I understand what this means. BruceWayneByday — for the first of many entries dealing with this series of events. ASharpEgret — because what is he leaping from? metroidzer0 — for the only Quantum Leap entry. kampfer91 — because this would certainly liven up Mario Kart. Bobotheteddy — because Assassin's Creed Onimusha would be lovely. Ninjariffic — for not the only Dune entry. BorntoSmash — mainly for the line "Courtney Love has a weird head." sabotahj — for communicating his idea in the best way. Chrury Sanson — because we're getting awfully close. MrSchaffner — for events in my lifetime counting as history. Arbek the Conqueror — for the subtlety. hackdriver — for Assassin's Creed: Avengers. SteveFish — because it's Ubisoft, and it's bound to happen. KBABZ — because this is what it will take for me to get excited about the series again. MrDeadScott — for making the world a better place. Arch Duke Maxyenko — but only if the mission is delivered as a Lincoln Log. uscg_pa — because this works way too well. toolsoldier — because it too me 10 minutes, dammit. Michael — because I actively bwah-hah'd. Hard2forgetme — for the cleanest of this type of shop. halfbeast — because it all makes sense now. Cartoonivore — for the deep cut. discoron77 — where everybody knows your name, except his. Crazy Tom — because I don't wanna wait, for our lives to be over. lharm — I told you there were a lot of these. sciteach — for braving the prequels. arniejolt — for making me watch this again for the 100th time. SkiBum232 — for the win!